Rolling Along…MAY, We’ve Been Waitng for YOU!!! When I was growing up, my father was a superintendent for a large steel construction company and this responsibility took him to many states along the East Coast where he would typically build a water storage tank for a small town…so, the family…my Mother, and later when I was 4 years old, my brother Michael…packed our old PEERLESS trailer, towed by an International Harvester truck, and moved to every job site with him and his “crew” of men. I learned about working hard, no matter what the weather, tackling obstacles and winning, meeting new people and making friends everywhere…and I got to wear a “toolbelt” and learn how to weld and I helped in the summer by taking fresh lemonade to the friends/workers that seemed like family to me. We often lived at or on the job site so this made it easy to learn and work for my father…always trailing along behind him in his 6 foot shadow…unless the crane was lifting steel, then I had to get out of the path of huge sheets of metal, dangling from cables and a hook, moving through the air…thinking back, those machines would be like TONKA TOYS today! During this experience, I learned from my Mother the importance of making a home wherever we went for as long as we were there…even if it was just a pot of red geraniums beside the steps, fresh apple pie or home-made chocolate cake for dessert. I learned from my father about flexibility, adaptability, practicality and organization…which ultimately became versatility…having graduated from high school after actually attending 24 schools in as many as 15 different states. The not so surprising truth…I became a traditionalist at heart…with the American flag waving over the job site everyday, 4th of July picnics and fireworks, turkey on Thanksgiving, hand cranked ice-cream, antique quilts, family reunions under huge oak trees, fresh tomatoes and vegetables from my summertime visits to grandmother and her garden…and oh, so much more! Nothing was ‘convenient’ or easy when it came to food yet we actually COOKED everyday, every meal…I learned to cook at 8-10 years old, collected recipes and still make grandmother’s pound cake for family and friends…a basket of fresh eggs just slipped from under the hens, juicy red tomatoes, milk still warm in the bucket, fresh hay in the barn…all familiar scents, flavors and tasks which trigger a lifetime of stored memories today. This is also the traditional time for me to really SPRING CLEAN…you know…moving the rugs and scrubbing the wood floor with lavender soap, scooping out the fireplace ashes and piling large bundles of rosemary & lavender trimmings in the grate, removing books and accessories and wiping down the bookshelves, changing the bed from flannel to crisp, all pure cotton, but heavy thread count, sheets and packing away the down comforter in lavender buds for the season…I spend all week making sure the house smells of lavender and lemon and the floor shines and the windows sparkle! I use my own homemade cleaners most of the time because they are cheap to make, much kinder and safe to use, less likely to cause allergies and leave a better fragrance. For tools I use old t-shirts cut into cloths, a cloth mop and bucket for the floor, a chamois for walls and only natural bristle brushes for tiles. Really simple to make: use a mix of red and gold cherry or grape tomatoes, 6 slices of cooked and crumbled bacon, [the nitrate-free kind, of course], and lots of chopped fresh basil leaves…the L in the BLT. For a dressing: mix 2Tb of red wine vinegar and 1/4 cup of olive oil and I like this with a tiny spoonful of mayonnaise added to the dressing…whisk and drizzle over the salad! OH, SWEET PATIENCE!! Just before the rain started I also managed to get the French Fingerling potato eyes planted in 2 bushel baskets I had placed near the compost pile. This way I can use a mix of dried, chopped leaves and compost to keep the sprouting potatoes covered…AND, I checked on the onion sets I had put out in late March…knowing the cool nights would persuade them to grow below ground rather than bolting to flower with warm spells. They showed 4-6 inches of strong green foliage poking through the soil. FRAGRANT BUNDLES…A few weeks ago the sun was actually shining, the day was warm, dry and temp close to 65, so I decided the conditions were perfect for trimming my lavender bushes since they had started putting on some green already. This yearly SPRING trimming will stimulate new growth all over and keep the bushes fresh and blooming for many years. Using my sharp FELCO pruners, I cut back all gray foliage leaving a nice mound of stems to sprout. This trimmed material is very precious as I use it to make fire starter bundles. Simple to make…just cut the trimmed lavender pieces into 6-8 inch long pieces, bundle together and tie with raffia or cotton twine. Often I put together a nice basket of these bundles to give as a hostess or housewarming gift…these “natural fire-starters” can also be made with rosemary, thyme, sage and other herb trimmings as you like. 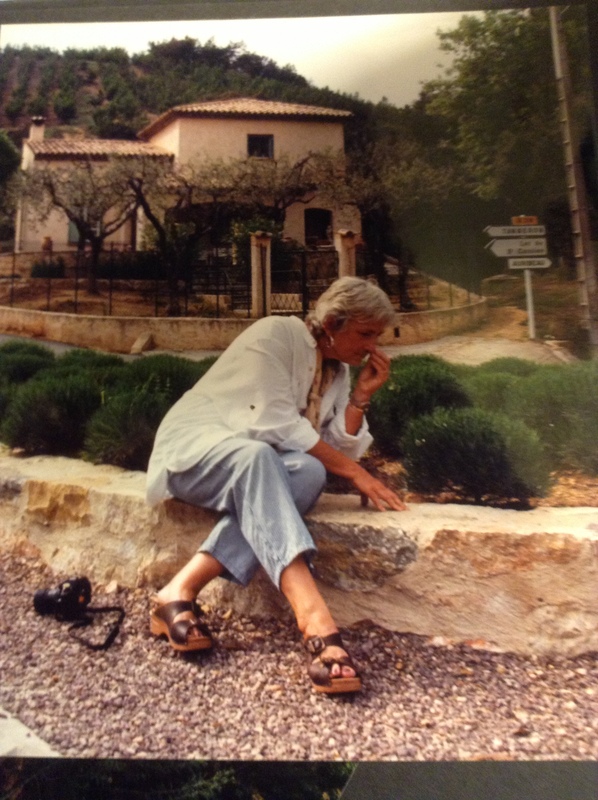 EARLY MAY…Here I am sitting on the ‘curb’ of a gravel road somewhere high up in the hills of PROVENCE…the lavender had been trimmed over a month earlier and the wonderful coastal weather had stimulated some rapid growth…rubbing my fingers through the stems…inhaling the fragrance…ahhhhh…sweet lavender. The old stone building behind me is a family home where they also run a business making…by hand using old methods and tools…a fabulously fragrant and luxurious collection of lavender, mimosa and rose scented soaps. TO ALL MY FRIENDS…thank you for following and for reading my blog…I plan to write more often and stay in touch with everyone who comments…the rough winter has passed along with some difficult days. Feeling renewed…restored and re-invigorated…with my flowers in the garden, photos of family and friends, my books, and a glass of wine…I am tired from a week of cleaning…but very happy!